Media captionA four-storey mill has caught fire in Bradford. More than 50 firefighters tackled a fire at a large four-storey disused mill in Bradford. The disused mill in Great Horton Road, is being damped down, West Yorkshire Fire and Rescue said. The building's roof was on fire and heavy smoke and flames could be seen shooting through. The mill - formerly an envelope business - was still smoking and the fire service advised nearby residents to close doors and windows. Alan Bannister saw the fire at its height and said: "I am now three miles away and I can see black smoke billowing across the city." 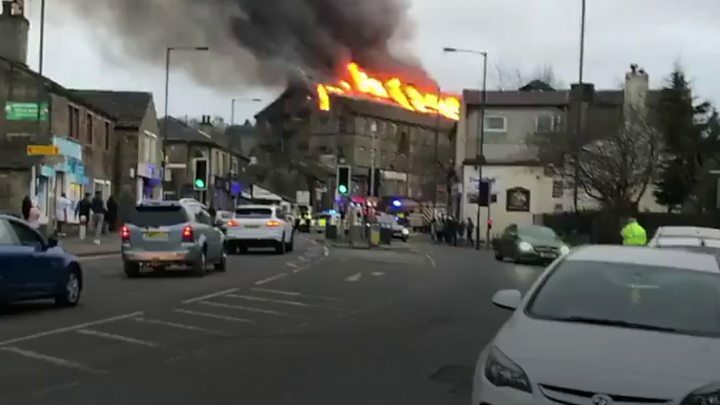 Joscelin Davidson wrote on Twitter: "Something is spectacularly on fire in Bradford tonight." The A647 Great Horton Road has been closed and bus services are being diverted. Motorists are being advised to avoid the area.